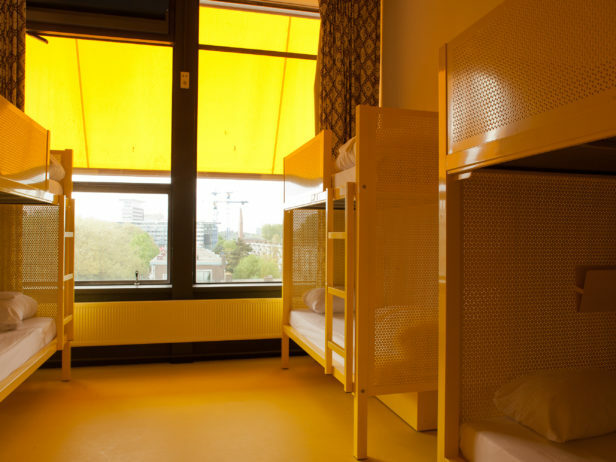 The hostel offers clean and mean rooms in primary colours, for city people and art lovers. Our family rooms are for a maximum of 6 persons. These private rooms are suitable for families or groups of friends and have private bathrooms either in the room or on the corridor. The rooms all have bunkbeds. The mix of temporary, art-minded guests with the artists in residence and the cultural activities in and around the complex, make WOW the perfect base from which to to experience Amsterdam’s cultural and artistic attractions. WOW’s lobby, restaurant and inner gardens are friendly and open places where you can easily make friends with like-minded people from all over the world.